Mr Tsipras was impressed with the activities of the GCM and the Greek-Australian community in general, and expressed the wish to visit Australia next year, during the Lonsdale Street Greek Festival. The meeting with the Prime Minister was arranged by the Deputy Foreign Minister, Mr. Terence Quick and SYRIZA’s member of the parliament, Mr. Chrysoula Katsavria - Sioropoulou. "Initially the meeting was scheduled to last 15 minutes, but it lasted nearly 40 minutes," said Papastergiadis, adding that "Mr Tsipras was excited by the projects and the activities of the GCM and especially with the Greek Centre for Contemporary Culture and the development of Bulleen. " Mr Papastergiadis briefed Mr Tsipras on the educational and cultural programs of the GCM, and on issues concerning the Greek community in general, such as the bilateral agreement on taxation and the satellite transmission of ERT programs to Australia. "We discussed our cultural program and the festivals organised by the GCM and the Prime Minister was interested in coming to the Lonsdale Street Greek Festival," said Papastergiadis. "He was amazed by the success of the festival and he could not believe that it attracts so many people." The ERT’s satellite programs in Australia was also discussed during the meeting and Mr Tsipras promised to personally look after this issue. "He was very interested in our educational programs and whether our children speak Greek at home," added Mr Papastergiadis. "For the Prime Minister the issue of teaching our language to our children is very important. We also discussed the bilateral tax agreement between Greece and Australia and how important it is for investments between the two countries." The restart of the student camp programs, was also discussed during the meeting which with the assistance of Mr. Quick will begin again next year. Finally, GCM’s proposal for the opening of a Greek Tourism office at the Greek Centre, was welcomed by the Prime Minister. Mr Tsipras was surprisingly well informed about the South Melbourne SC, because as he said, it is one of the best football teams in Australia. At the meeting there was also a gift exchange. Among other things, the President of the GCM handed over to Mr. Tsipras a boomerang and historical books about Melbourne. "It was a very important meeting,” Mr Papastergiadis said. “We should especially thank Mr. Quick and Mrs Katsavria for their invaluable assistance in organising the meetings in Athens." 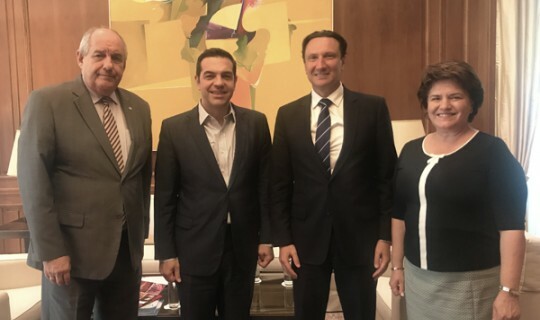 During their visit to Athens, Mr. Papastergiadis and the General Secretary Mr. Costas Markos also met with the President of the Hellenic Republic, the Minister of Culture, the Minister of Tourism, the Mayor of Athens and leaders of political parties.